Stray kitten Stumpy arrived at our shelter with a horrific injury to his tail, leaving the tiny kitten in excruciating pain. “Half of Stumpy’s tail was severed off. It was literally hanging by the nerves,” said Reeva, veterinarian in the Shelter Medicine Department. 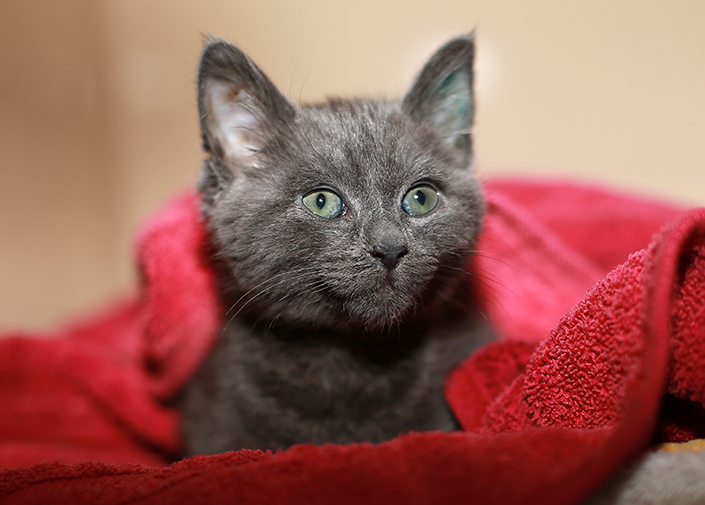 The nine-week-old kitten was rushed to the shelter hospital, where he was given pain relief and antibiotics. Due to his condition, vets had to perform emergency surgery. Stumpy was in a lot of pain. He was also at risk of developing infection and blood poisoning,” said Reeva. It’s unknown what caused Stumpy’s injury – whether his tail could have become caught in something or been bitten by a larger animal. But, the brave kitten quickly bounced back from his operation. Stumpy has found a loving new home where he will always be cared for, but we still have many other cats and kittens waiting for their second chance at happiness. View pets for adoption online or meet them at our North Melbourne shelter. Each year, our Shelter Medicine Department performs around 20 amputation surgeries on homeless pets who have suffered trauma. Donate now to help change the lives of dogs and cats, just like Stumpy.